Before starting a hiking tour through the GEOPARC Bletterbach, it is certainly worth it to stop by at the Visitor Centre of Aldino-Aldein or at the GEOMuseum in Redagno-Radein. 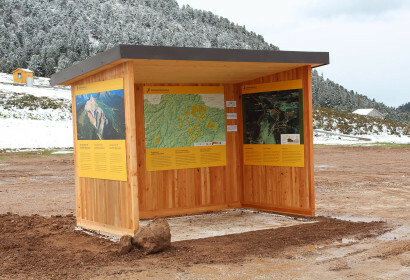 Visitors will get an overview with posters and explanations on why the Weißhorn and the Bletterbach gorge are so interesting, and on everything else worth discovering. Visitors will get further information about different hiking tours, our guided tours and our range of offers for families with children. At the Visitor Centre in Aldino-Aldein and at the GEOMuseum in Redagno-Radein it is possible to rent protective helmets and get information about safety measures with respect to the GEOPARC Bletterbach as well as further information about the current weather conditions and the accessibility of the canyon. The Visitor Centre located above Aldino-Aldein shows the single steps of the development process the rocks in the Bletterbach gorge underwent. In addition, it exhibits fossil funds from the gorge as well as traces of dinosaurs, petrified fish species, shells and plants. Visitors get to know appealing aspects and interesting facts about life in this area of millions of years ago. Getting to the GEOPARC Bletterbach from Ora-Auer or Egna-Neumarkt passing Montagna-Montan and arriving at Aldino-Aldein. From there turn right after about 1 km (0.6 miles) after the village centre into the district Lerch in direction of Bletterbach, and proceed until the parking of the Visitor Centre. 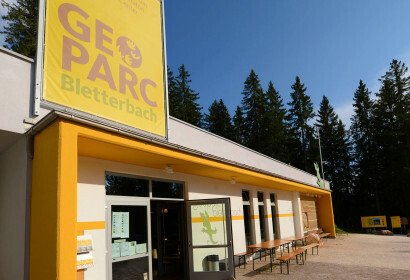 On-site you will get valuable information for an adventurous day at the GEOPARC Bletterbach. This is also the starting point of the GEOPath through the Bletterbach gorge and the educational trail through the forest for children, elderly people and disabled people. There is also a public bus line to the Visitor Centre in Aldino-Aldein. Please find the current timetable on the homepage of South Tyrol’s transport associatio. 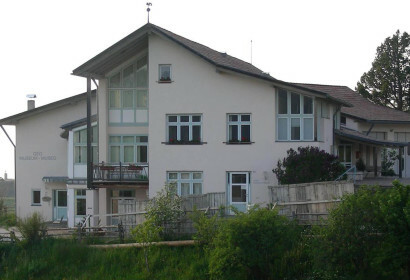 The GEOMuseum Redagno-Radein is located at the town’s school next to the church and offers special funds selected from the Bletterbach gorge. Poster panels with simple and comprehensible, scientifically sound explanations lead everyone interested in geology through millions of years of geological history. Should you choose the GEOMuseum Redagno-Radein for your hiking tour through the Bletterbach gorge, pass Fontanefredde-Kaltenbrunn travelling in direction of Redagno-Radein. Parking possibilities in Redagno di Sopra-Oberradein at the entrance of the village as well as limited parking slots directly at the GEOMuseum. During summer season, it is possible to take the bus to Redagno di Sopra-Oberradein. For a longer hiking tour through the Bletterbach gorge, you can start your tour at the Passo Oclini-Jochgrimmpass. Travel over the Passo di Lavazé-Lavazéjoch, either by passing the Val d’ega-Eggental valley or Cavalese. After a walk of about 45 min., you will pass the Gurndinalm mountain pasture and reach our new viewpoint passing the panorama trail.